Operates between Valley West Mall, Mercer/Marsh and the business parks in northwest Urbandale. Connections: Local Routes 3, Crosstown Route 52 and Flex Route 72 at Valley West Mall. Guaranteed Ride Home: In case of an emergency, DART will guarantee a ride home to individuals riding Route 74, between the hours of 8 a.m. and 3:30 p.m., Monday through Friday. To qualify for a Guaranteed Ride Home, you must be a monthly bus pass holder, Unlimited Access participant or RideShare vanpooler. For full program details, click here. 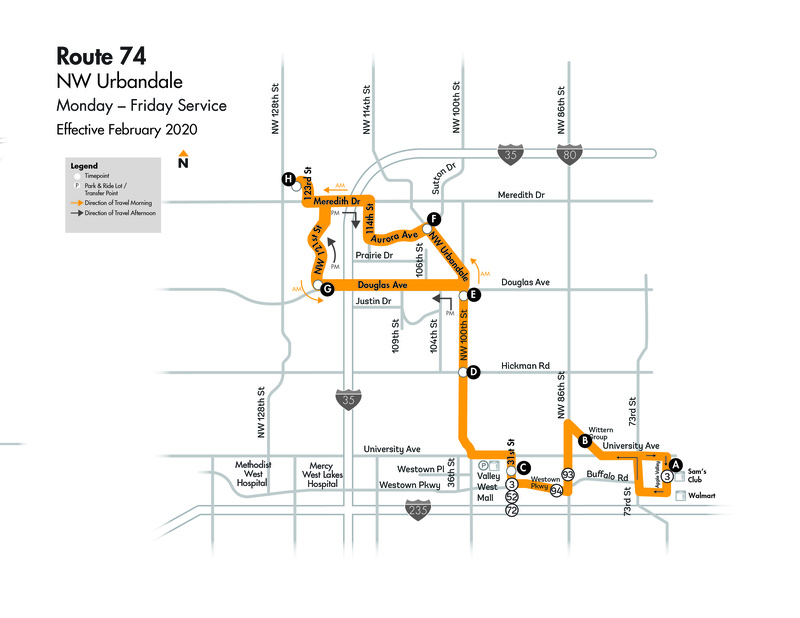 Route 74 is timed to connect primarily with Route 52 to/form DART Central Station at Valley West Mall. Connections with Routes 3, 52 to/from Jordan Creek Town Center and 72 cannot be guaranteed.